The story of this breed started in 1980s. The name "Keuda" is actually an acronym that stands for "Kitten Evaluation Under Direct Assessment". This is a name of a program (that was taking place in Oklahoma, New Mexico, and Texas) investigating the "type" of cats that survived as barn cats. This breed was not recognized and was considered rather a "type" for a long time. Even today this breed is not fully-registered and wide-known, for it has been in development since about 2002. 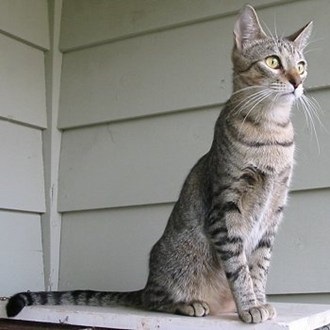 The American Keuda cat resembles the Egyptian Mau very much. But although Keudas seem to have Mau roots, this cannot be proven. The medium-sized body of American Keudas is well-boned and very athletic. These cats were built for speed and climbing. Just like the Egyptian Mau, Keudas have extra skin flaps on the belly and under the elbows, which allow the cat hyperextend the legs and run like a cheetah, and even twist to confront an attacker. The head is medium-seized. The muzzle is neither short nor long ("refined"). The ears are medium to large and have a slightly rounded triangular form. The eyes are almond-shaped. The legs are proportioned to the body, with oval paws. The slightly tapering tail is also proportioned to the body. American Keudas are known as active, outgoing, inquisitive, soft-voiced, and intelligent cats. They are pretty adaptable and social. They get along well with children and other pets in the house (provided that proper introductions have been made). They like playing with water, so it is recommended to keep fish bowls covered in their presence. Do not be surprised if your lovely Keuda will accompany you in the shower, or will want to "help" you with the dishes. The colony spirit is rather strong in Keudas, so they will often mother a new kitten or defend the garden from a neighbour dog (being friends with your own dog at the same time). Since their physiology is perfect for running, Keudas love it. They love active games with running, jumping, and climbing. So make sure you have bought some scratching posts, stair-steps, cat trees, and other necessary cat furniture (the more, the better). American Keudas can be taught to walk on a leash. American Keudas are shorthair (sometimes medium-hair). The guard hair is medium length and feels silky and slick, with a lustrous sheen. The undercoat is very little and it does not thicken much in winter. American Keudas come in nearly all patterns and colors: solids (white, gray, brown, black, red, creams, chocolate), shaded (smoke, chinchilla, silver, golden), and combinations (tabby). Sometimes they even look like the Egyptian Mau, Siamese, or Havana Brown. Because of their origin, American Keudas have the best possible health that a natural cat can have. However, because of the extremely thin undercoat, Keudas cannot tolerate cold weather well. Why Are Some People Allergic To Cats? How Can I Understand My Cat?